Creation of new District will facilitate in bringing effective administration and development in the area: Governor. The Governor of Arunachal Pradesh Brig. (Dr.) B.D. Mishra (Retd.) visited Pakke Kessang District on 6th February 2019. With this visit, the Governor has tour all the 25 districts of the State, in which generally tours were undertaken by road. In his maiden visit to Pakke Kessang after it became a District, the Governor addressed a public meeting. He congratulated the people of Pakke Kessang for the new District and expressed his hope that it will facilitate in bringing effective administration and development in the area. The Governor advised the people, government officials, Gaon Buras, Gaon Buris and contractors to ensure that all the infrastructural developments are implemented with proper planning, transparency, honesty and 100% utilization of fund for the purpose its has been provided for by the Government. They must be prepared for audit and review and wherever required there must be mid-course correction. Impressed by the scenic beauty of Pakke Kessang, the Governor said the nature has bestowed the people of the area with huge natural resources and they must harness it with their hard work in a dedicated and judicious manner. He said that the pace of development depends upon the people and their approach and outlook, and that is where the collective effort of the people matter for success. Citing example of Dulari Kanya Yojana, the Governor called upon the people to avail maximum benefit from welfare schemes and programmes of the State and Central Governments as administration is now come to their doorsteps, from Seppa to Lemmi. He also called upon the district administration, government officials and Gaon Burahs to motivate and select eligible and abled bodied youth for recruitment in the Indian Armed Forces and State Police. Sharing his meeting with Chief of Indian Army at Itanagar recently, the Governor informed the people that Indian Army will open its door for recruitment of girls in rank and file very soon. 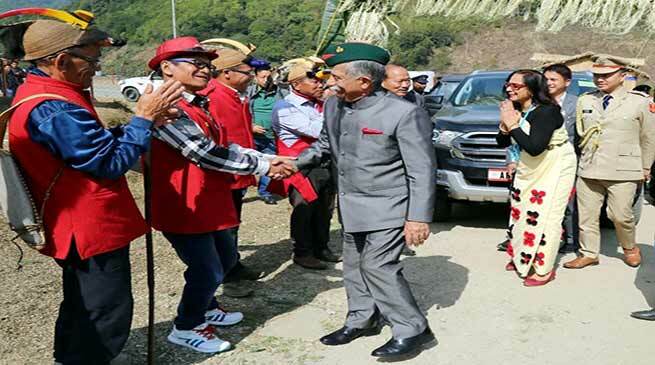 Responding to a memorandum submitted by the public of Pakke Kesang, the Governor said that road, rail, air, mobile and internet connectivity are the basic ingredients for bringing development in any part of the world. He assured the people of Pakke Kessang to look into the issues to help resolve them. Earlier, in the Governor, visited Government Secondary School, Pakke Kessang and interacted with the students and teachers and distributed sweets. Speaking to the students, the Governor said that today’s students are the future of the State and they must prepare themselves for the future challenges. He advised them to focus in the studies and also actively participate in sports and cultural activities. The Governor cautioned them against drugs, smoking, liquor and gambling. The Governor also advised the teachers to devote maximum time to their students, not just as a teacher but as their guardian, coach, friend and guide. He asked them to prepare their students for admission in better educational institute, like Sainik School, Pasighat. Expressing his concern about education, the Governor assured to take up with Education Minister for permanent Headmaster in the Government Secondary School, Pakke Kessang. The Governor, on reaching his office has already informed the Secretary, Education Department Dr. Madhu Rani Teotia, IAS to do the needful. The Governor assured the School Children to help make available the textbooks for them well before the academic session. He also assured the school to provide sufficient books for the school library. The Governor visited the Community Health Centre (CHC) at Pakke Kessang and interacted with the medical officers and the staff before the public meeting and assured to provide an investigation kit for the Hospital. At the request of the Governor, the Local MLA Biyuram Wage accepted to provide an ambulance for the CHC at the earliest. Local MLA Biyuram Wage and Deputy Commissioner Tamuna Messar also spoke on the occasion and highlighted the potential and challenges of the new district.